different courses. To enter a chao in the races all you do is head to the regular Chao Garden and go through the door behind the waterfall. you want in the races, and the specific course to race in. There are 6 different Race categories and 10 different tracks altogether. Here's a quick list of the Race categories and tracks. Any Chao can enter, 3 difficulties. 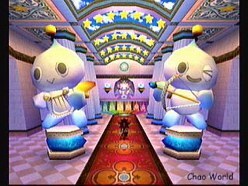 Any Chao can enter, 5 difficulties. Your Chao can also win Toys from the races. The Toy they win depends on the race the Chao wins. Toys won from the Begginer and Jewel Races are kept by the Chao that wins them, the Chao will pull them out when it wants to use them, a Chao will lose it's personal Toys when it Dies/Reincarnates. Toys won from the Challenge, Hero and Dark races are kept in the Garden and can be used by all the Chao in that Garden. The Neutral Garden has the Toys from the Challenges Races, the Hero Garden has the Toys from the Hero Races and the Dark Garden has the Toys from the Dark Races. Here a list of what Races give your Chao what Toys.